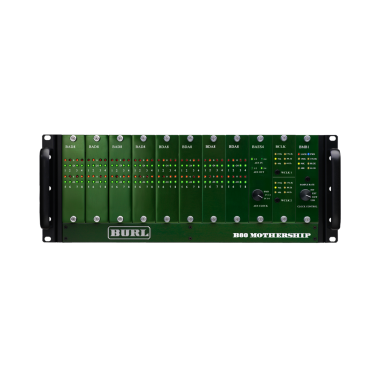 Simply put, the B80 MOTHERSHIP has redefined digital recording. For anyone who has felt that digital recording has been lacking soul, warmth and musicality, the B80MOTHERSHIP is the answer. Building on the technology of the two-channel B2 BOMBERS, the B80 MOTHERSHIP was forged from BURL AUDIO’S deep dedication to analog class-A circuitry. The result is not only heard, it is felt. The MOTHERSHIP stands out from every other interface on the market not because it is colored, but because it does not sterilize the source. Digital interconnect is also completely configurable, and controlled by a swappable motherboard. BURL AUDIO offers five digital motherboards. 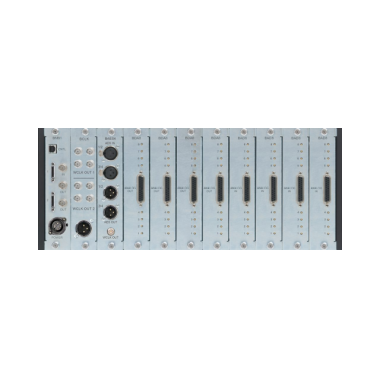 The BMB1 comes standard with two DigiLink connectors for direct hookup to Pro Tools. BURL AUDIO does away with the expansion port, making both primary ports. That means you can play 64 DAC channels straight out of Pro Tools with one unit! Powering a unit like the B80 MOTHERSHIP takes some juice, so we designed the BP250 to drive the 80 channels of class-A analog circuitry. With a 250 watt continuous power capability, and +/- 24 volt rails, a multi-channel AD/DA converter is finally getting the power it deserves.